Press reports in the past week have revealed a very close relationship between former Labour prime minister Tony Blair and Nursultan Nazarbayev, the dictatorial ruler of mineral-rich Kazakhstan, writes Ken Douglas. The school student strikes of 1985 showed how young people are able to organise and fight back when their futures are under attack, writes John Cosgrove, Liverpool Youth Fight for Jobs. 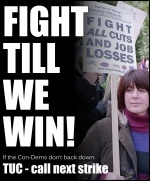 The Socialist is a weekly paper that opposes all cuts to jobs and services. 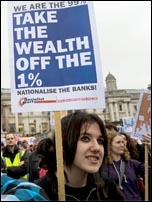 Why should we suffer cuts to pay the bankers' deficit, while those very same bankers - many of whom financially back the Tories, continue to enjoy a life of luxury? 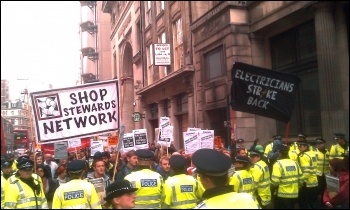 As the Jarrow March for Jobs arrives in London... 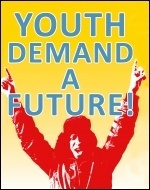 Youth demand their future! 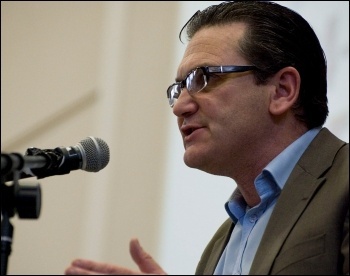 Pension talks: Opponent wavers, now's the time to push ahead with action! 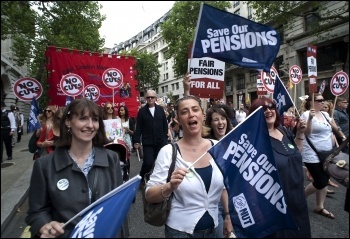 Mark Serwotka calls pensions raid only "slightly less"
Commenting on the latest government offer on pensions, PCS general secretary Mark Serwotka said it "would still force public servants to pay more in and work longer for less in retirement". 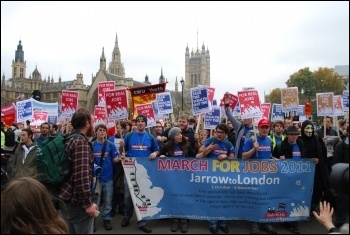 On Saturday 5 November the Jarrow March for Jobs came to an end with a demonstration of thousands in central London, writes Ollie Fournier, Cambridge. On 4 February 1935, Ceridwen Brown of Aberdare led an army of women, some carrying babies, to Merthyr Tydfil Unemployed Assistance Board (UAB) offices, writes Geoff Jones. Miliband the militant? No way! Labour Party leader Ed Miliband has come out in favour of the occupation at the London Stock Exchange, writes Paul Gerrard. 'National unity' government will pursue same austerity measures: Greek prime minister George Papandreou has been forced to leave office. His Pasok government will be replaced by a 'national unity' coalition government. 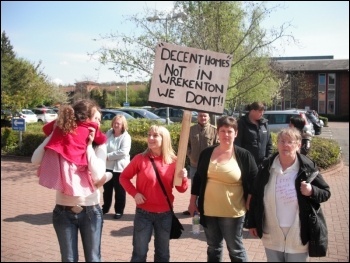 Construction workers kettled - please send urgent protests! 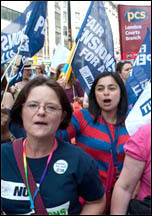 Build for 30 Nov strike - The fight of all our lives! 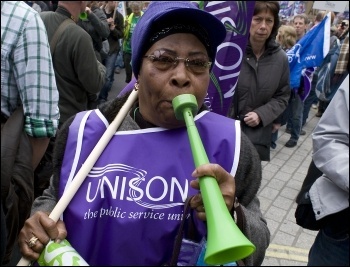 We’re just days away from 30 November, when up to three million public sector workers will be striking to defend their pensions. This will be an overwhelmingly popular strike because all those who have suffered from these cuts want someone to stand up for them. 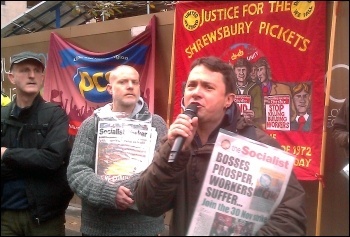 While the 30th November public-sector strike dominates the news, contract cleaners working on West Coast mainline trains have won a 10% pay rise, writes Hugh Caffrey, north-west Socialist Party. 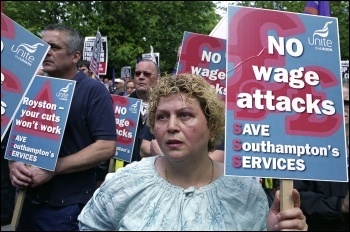 Southampton council workers have been at the forefront in recent months in fighting savage pay and job cuts by the Tory council, writes Nick Chaffey. 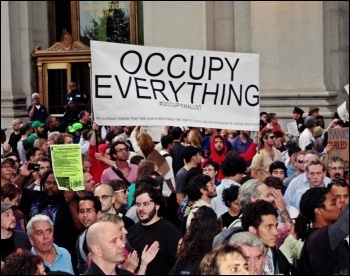 End the dictatorship of the markets! 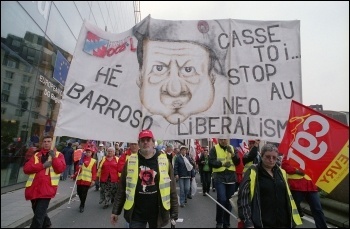 The imposition of the 'technocrats', in reality bankers, in both Italy and Greece, shows the seriousness of the crisis for the capitalist class nationally and across Europe, writes Paul Murphy, Ireland Socialist Party MEP. Jobs crisis - 'We can't afford capitalism'! "Decent jobs and decent pay!" 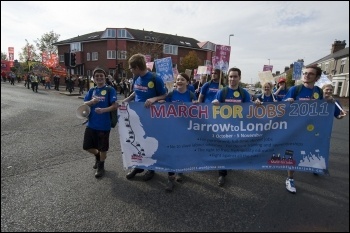 That was the modest demand of the young people on the Jarrow Youth March for Jobs, writes Sarah Sachs-Eldridge. Cuts to public services and benefits are causing massive suffering and misery. 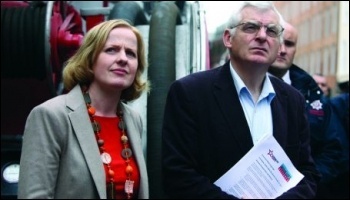 Tragically, the bodies of a vulnerable couple, Mark and Helen Mullins, were found in their Warwickshire home this month. Emboldened by the construction electricians' protest in London on 10 November, around 200 sparks turned up at Corus Steel on Teesside on 14 November, writes Elaine Brunskill. 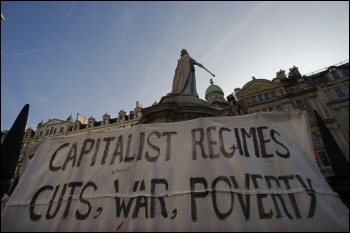 Capitalism is crisis - there is an alternative - fight for socialism! The titanic 30 November strike will display the colossal power of the working class to resist the savage cuts demanded by the capitalists and Con-Dems, writes Peter Taaffe, General Secretary, Socialist Party. 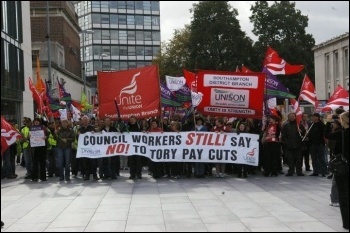 South Yorkshire bus drivers, members of Unite the union, took strike action on 18 and 21 November. 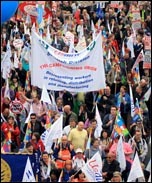 Many pickets were out all day on both days at the Barnsley and Rawmarsh (Rotherham) depots, writes Alistair Tice. It is with great sadness that we report the passing of comrade Geoff Atkins following a long struggle with cancer, writes Nick Chaffey. 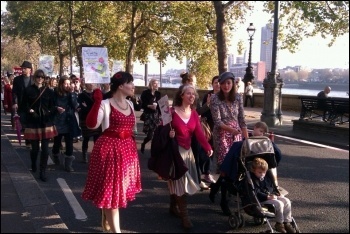 Women: sick of sexism, discrimination and cuts? It doesn't have to be like this! 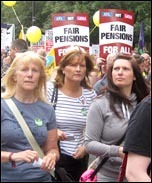 : On 30 November millions of workers will participate in what is likely to be the biggest coordinated strike action since the 1926 general strike, writes Eleanor Donne, Socialist Women steering committee. Earlier this year Coventry's Labour-led council proposed to remove £1 million from the annual £1.8 million budget for day care at Sure Start centres in the city, writes Dave Nellist, Socialist Party councillor, Coventry. 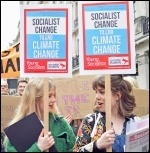 Minimum wage not to blame: On the day that the latest unemployment figures were announced I was asked to debate with Mark Littlewood of the Insititute of Economic Affairs (IEA) on the Tony Livesy show on BBC Radio 5Live, writes Paul Callanan, Youth Fight for Jobs national organiser. 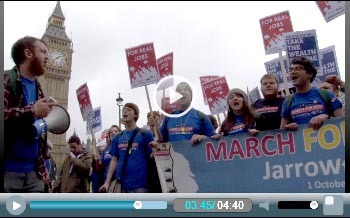 On Tuesday 15 November, I was asked to appear on a live Newsnight debate alongside 29 other young people who were either unemployed or underemployed, writes Ian Pattison, Jarrow marcher. On 14 November, my nephew was arrested after taking part in a protest outside Knowsthorpe incinerator in Leeds against Stericycle, writes Dylan Murphy. Greece and Italy get unelected technocrats - Southampton gets chief executives! 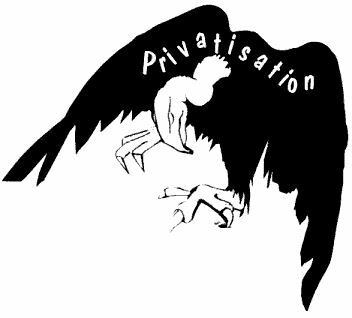 A November Southampton city council meeting approved the 'change programme', newspeak for the wholesale privatisation of council services, writes Gavin Marsh, Southampton Anti-Cuts Union. This morning 150 construction workers occupied the head office of Grattes Brothers in Kings Cross, protesting against the tearing up of the JIB agreement. 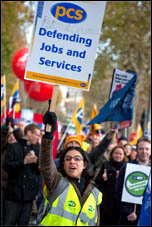 Millions unemployed - workers and students must unite and fight! 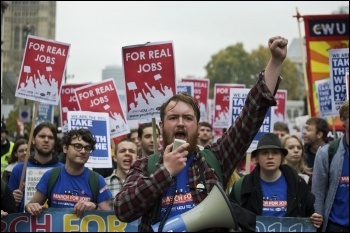 Unemployment is now 2.62 million in the UK, and youth unemployment stands at 1.2 million - the highest number since records began, writes Alex Moore, Jarrow marcher. Arrested in Kazakhstan - Free Georgii Epshtein! The Eurozone is at a tipping point. EU leaders are in disarray and have no clear strategy for resolving the crisis. Fragmentation of the Eurozone could trigger another deep financial crisis and global economic downturn. 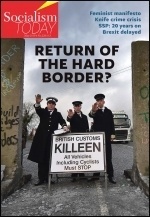 Lynn Walsh, Editor, Socialism Today, monthly magazine of the Socialist Party, analyses the crisis. 30 November shows... We can win! 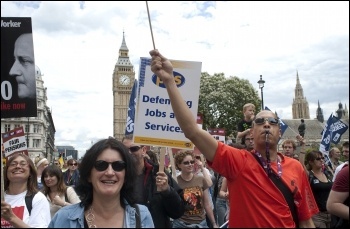 Scroungers: There are today in Britain a group of well-paid public sector workers who are bleeding the economy dry, not creating any wealth and just contributing to the debt, writes Dan Gillman, Waltham Forest teacher. 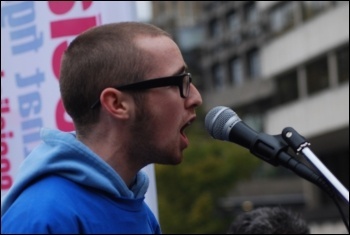 A Leeds Against the Cuts public meeting during the build-up to the 30 November strike action saw a resolute and defiant mood as people agreed the government's plans were a daylight robbery of pensions, writes Nial Vivian, Hyde Park and Headingley Socialist Party. But military-controlled elections do not signal transition to democracy: Long queues formed at many polling stations, on 28 November, in Cairo and other Egyptian cities and towns, writes Niall Mulholland. 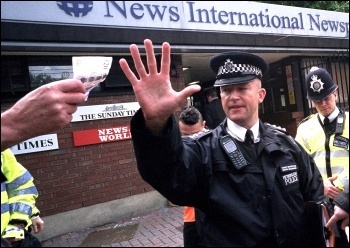 Ian Hislop's BBC documentary 'When Bankers Were Good' starts by quoting ex-New Labour minister Peter Mandelson's line "I'm intensely relaxed about people getting filthy rich", writes Ian Pattison. Sepp Blatter, the reactionary, out of touch head of FIFA (world football's governing body), recently told a CNN interviewer that there is no racism in football, writes Chris Newby. The Tory solution to pensioner poverty? The winter fuel allowance scandal: You will have heard of Good King Wenceslas. You may not have heard of his evil twin Bad King Wenceslas, writes Derek McMillan. 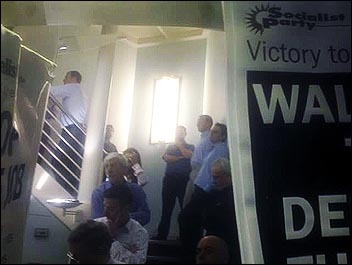 Construction electricians brought their campaign of defiance to the home of one of the 'Dirty Seven' contractors in London on 23 November, writes Rob Williams, National Shop Stewards Network chair. Preparing the ground for a mass movement of young people: On 1 October a group of young people from every corner of the country - mostly strangers to each other - gathered in Jarrow, just south east of Newcastle, writes Sean Figg, Jarrow marcher. Kazakhstan: Demand Georgii Epshtein's release! 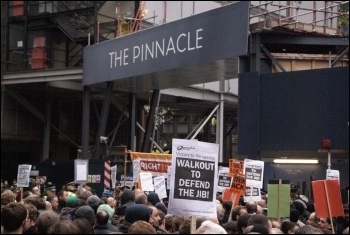 Strike to fight pay cuts: The pressure is building on the 'Big 7' major construction companies who want to withdraw from the Joint Industry Board (JIB) agreement and impose the new BESNA contracts which will cut pay by up to 35%. Who cares about home care? 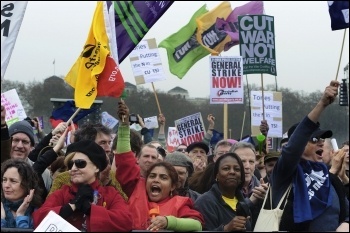 As almost three million workers prepared to strike against one onslaught on their future, business secretary Vince Cable was announcing another, writes Dave Gorton, Unite LE/372 branch. 'Thanks to my Tory MP': I know it might sound a bit strange but I've got so much to thank my Tory MP for, writes Darren Gibson, Brighouse.